lucy violet vintage: Vintage Christmas Card # 3, and Campbelled Eggs - A Recipe. Vintage Christmas Card # 3, and Campbelled Eggs - A Recipe. I couldn't come up with anything as wonderful as this with a paint brush between my fingers - let alone my big clod-hoppers! Next up, a retro Christmas recipe. Cambelled Eggs is aka Christmas Morning Eggs for People Who Can't cook (it could also be called Christmas Morning Eggs for People Who Don't Want to Eat!) I found it here when I was looking for recipes for our retro cook-off, and because it looked so festive - a pretty eggy wreath, and it involved canned soup I had to give it try. Stir soup until smooth. Blend in eggs and pepper. In skillet, melt butter, pour in egg mixture. Cook over low heat until set. I'm inflicting serving this to the girls for dinner! And because it wouldn't be a retro recipe without the gag-o-meter...verdict: don't bother. It tasted like scrambled eggs with the off-putting addition of 'chicken' chunks - and I can't vouch for the authenticity of the chicken! Adelaide just got home from work and her first words when she got in the door were "Mum, have you been cooking dog food again?" Says it all really. How funny. I swear I was going to say the exact same thing as Lea. Christmas eggs - ugh x 100!!!!!!! Ummm, it does look like one of Fanny Cradocks creations, but dog food ?? Really? The tomato baubles are very festive! Adding tinned soup must have been very progressive in its day as a lot of those recipes called for it. The card is also lovely but I'm still in love with the header card most of all. 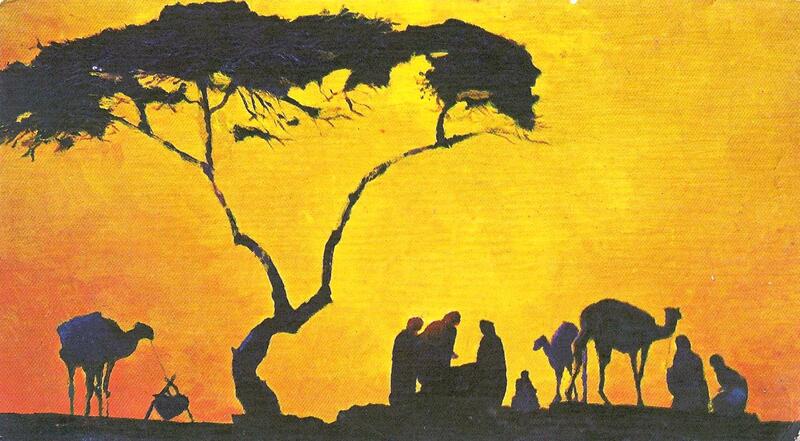 The silhouette painting is lovely. Scrambled eggs with chicken soup? That's quite bizarre! what came first the questionable chicken or the scrambled egg? ?....or the very unlucky dog! what were they smoking in that test kitchen at Campbells?! gag-o-rama!!! scrambled eggs and chicken soup? bleurgh! i do like the christmas wreath around the endged though, if only i had some cherry tomatos ripe i'd be tempted to decorate everyones plate like that for the duration! I have to say that the wreath idea is really cute, but the minute I saw "Campbelled," I knew we were in for trouble. That can't ever be a good thing when combined with eggs. The only word that's more synonymous with "Yuck" in retro recipes is "SPAM." I'll be laughing about Adelaide's dog food comment for the rest of the day. ps I LOVE your festive header. Beautiful. Well - I think yours looks prettier if that's any consolation - but to be honest sounds revolting! Beautiful card at the start - love the merging of those warm colours. I love those cards painted by feet or mouths. They are stunning. I have quite a lovely few from opshops! And reply to your question re my wreath..yes you may! Oh you are hilarious!! Doubt whether I could entice anyone here to eat that egg. That card is gorgeous..love the vibrant background colour. YUCH again. Why do you persist with the retro food made with things not found in nature? I love the card.